Black corals (Antipatharia) are a group of deep water, tree-like corals related to sea anemones. They normally occur in the tropics. They are also found in rather dark water areas such as New Zealand's Milford Sound where they can be viewed from an underwater observatory or via SCUBA diving. There are about 280 known species of Antipatharians in 42 genera. Though black coral's living tissue is brilliantly colored, it takes its name from the distinctive black or dark brown color of its skeleton. Also unique to black coral are the tiny spines that cover the surface of the skeleton, the origin of the nickname little thorn coral. In the Hawaiian language, black coral is called ‘ēkaha kū moana and is the official state gem of Hawaii. 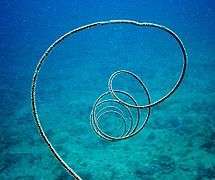 Black coral is listed in Appendix II of the Convention on International Trade in Endangered Species (CITES). 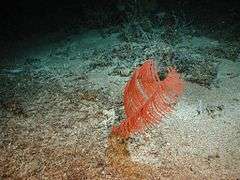 In March 2009, scientists released the results of their research on deep-sea (depths of ~300 to 3,000 m) corals throughout the world. They discovered specimens of Leiopathes to be among the oldest continuously living organisms on the planet: around 4,265 years old. They show that the "radial growth rates are as low as 4 to 35 micrometers per year and that individual colony longevities are on the order of thousands of years". Whip coral (Cirrhipathes species) host as many as six other species. 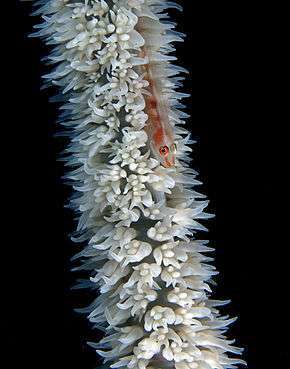 Whip coral gobies and barnacles permanently inhabit the skeleton. The goby and shrimp quickly hide on the opposite side skeleton's when a threat approaches. The goby and damselfish lay their eggs on the skeleton. The damselfish bites off the polyps to expose the nesting site. 1 2 3 Opresko, Dennis. "Spotlight on Antipatharians (Black Corals)". NMNH.typepad.com. ↑ Grigg, Richard W. (1993). "Precious Coral Fisheries of Hawaii and the U.S. Pacific Islands" (PDF). Marine Fisheries Review. Seattle, Washington: National Marine Fisheries Service, NOAA. 55 (2): 54. Retrieved 29 September 2010. ↑ Roark EB, Guilderson TP, Dunbar RB, Fallon SJ, Mucciarone DA (2009-02-10). "Extreme longevity in proteinaceous deep-sea corals". Proc Natl Acad Sci USA. 10.1073/pnas.0810875106 (13): 5204–8. doi:10.1073/pnas.0810875106. PMC 2663997 . PMID 19307564. ↑ Graczyk, Michael (2009-03-25). "Scientists ID living coral as 4,265 years old". The Associated Press. ↑ Murphy, Richard C. (2002). Coral Reefs: Cities Under The Seas. The Darwin Press, Inc. ISBN 0-87850-138-X. Opresko, Dennis. "Spotlight on Antipatharians (Black Corals)". NMNH.typepad.com. "Antipathidae". Integrated Taxonomic Information System. Mead, Gale (2001-06-08). 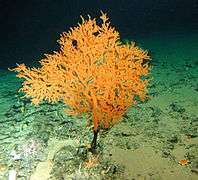 "Research Expedition Aimed at Halting Loss of Black Coral". National Geographic News. "Black corals (Leiopathes spp.)". ARKive.